Was out last Sunday and figured the place to look for any early fall color would be north of Two Harbors. CN was running a Minntac train off the Range with DMIR 400 leading so I headed up near Highland. Didn't find much or any fall color and found the only clouds pretty much in the whole state of Minnesota. This past Saturday night the LSRM dedicated former DM&N business car Missabe in front of a nice crowd at the museum. The car was moved in for its official public debut with Tom Gannon and his wife Ilene riding on the rear platform. Tom was the driving force behind the car’s restoration and oversaw every detail. The car is stunning and will make a great addition to the collection. Eventually the museum plans to have the Car Northland and Car Missabe next to each other so you can look in the end platforms of these two DM&N gems. Here are a couple of daylight shots as Kent and Tim moved the car out of the shop. 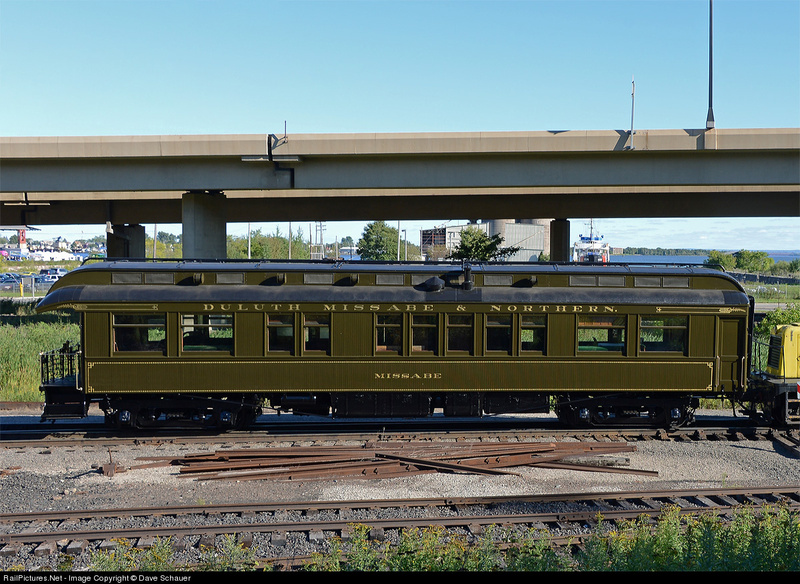 Tom mentioned the general name for the paint is Pullman Green but in his research and paint chip evidence he found the color was actually lighter so it is painted in a true shade of that green (it looks more like a deep olive). The car was hard to shoot because of the glint from the paint and its rich dark color. The lettering is actual gold leaf that Tom applied by hand in a painstaking process. While it not approaching the grain rushes of the past, there has been a noticeable amount of grain moving through Superior since the beginning of this month. Sunday was pretty quiet around the elevators, but BNSF made at least one trip with a switch job to pull empties out from under the Blatnik Bridge and towards 28th. Here the empties pass under Highway 53 on their way to the Corridor behind BNSF 2703. This wasn’t the best scan but here is a shot I took when the Fs were being cut-up at the Harbor. I’ve seen a few taken just after the accident but don’t know if they are on the web. 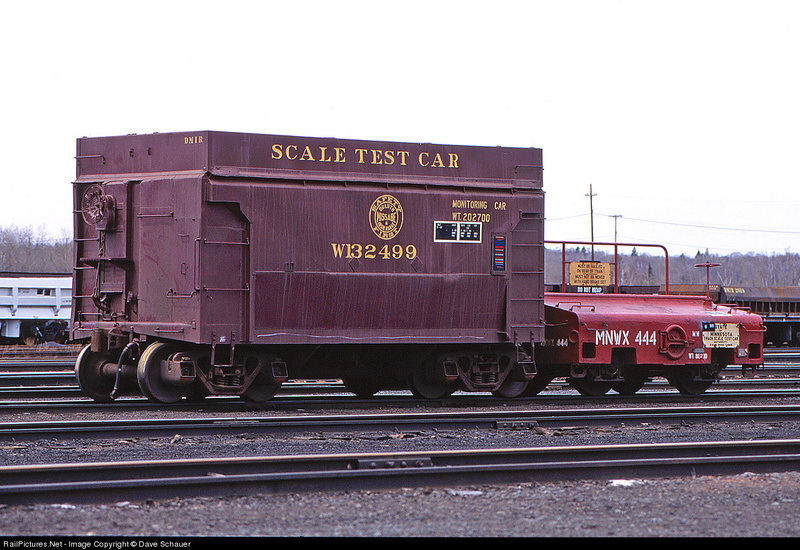 While digging through some slides I came across this shot of two scale test cars at Proctor. 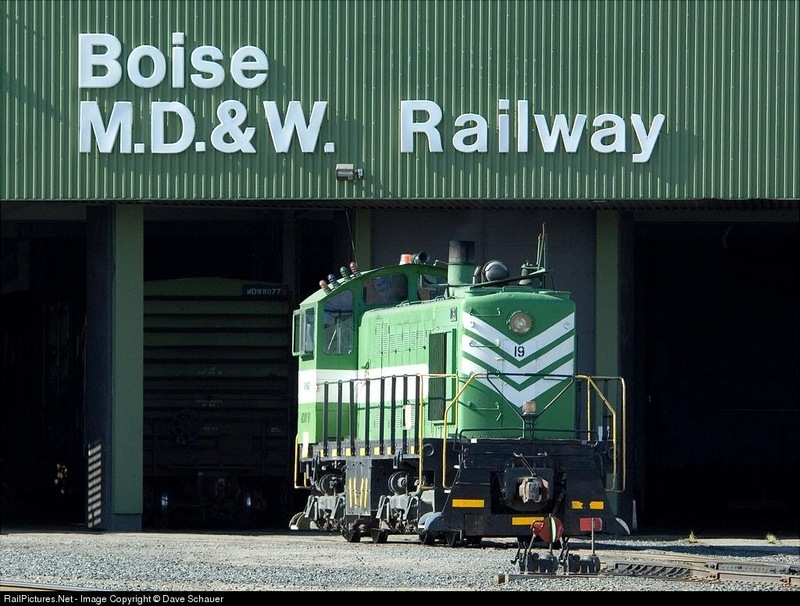 I always liked the Missabe’s version, it looked so “beefy” for a test car (it was converted from an ore car that had earlier been converted to a diesel sand car). The State of Minnesota car is what traditional scale test cars look like. I’m not sure what happened to the Missabe car but it likely was scrapped. Was able to catch a couple in Superior on Monday after work on a beautiful September day. Crossing over the Blatnik Bridge I noticed a BNSF job shoving about 50 cars into CHS. Since it took some time to place the grain loads on three different tracks, I was able to get in position for a shot of BNSF 3004 and the former IAIS that has been working around town. From the newswire: Boise Inc. (NYSE: BZ), which owns an International Falls pulp and paper mill, has agreed to be acquired by Packaging Corporation of America (NYSE: PKG) in a deal valued at nearly $2 billion. Every September through October the local grain elevators see an uptick in activity and this past week I was able to get a couple of shots around town. 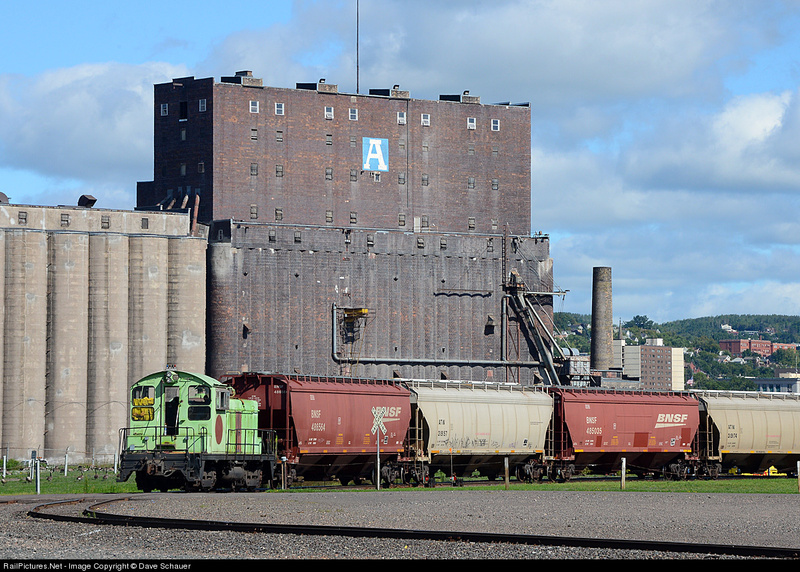 First was at Riverland’s former Cargill elevator where their green SW-1 was moving cars around. I also saw their black GE centercab but it wasn’t moving or in a position to shoot. Soo 2719. Finis for me. Here a some shots from this past Friday's 2719 operations. No new locations just a photographic reflection. Roster shot at the LSRM. Victor next to the vanquished. Read more about Soo 2719. Finis for me. The traditional fall grain “rush” seems to be here with BNSF operating a number of unit trains in and out of the Ports and CP having a healthy amount of grain on their trains as well. 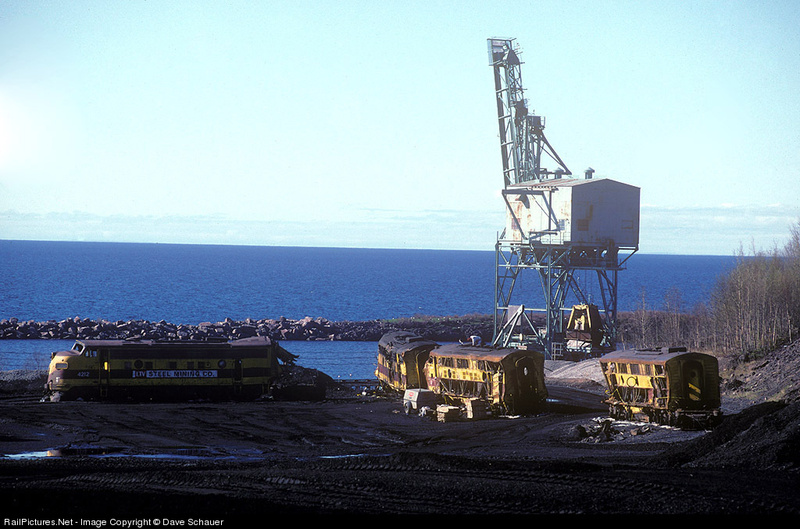 Although not nearly what it was decades ago, it is still nice to see big BNSF engines in Duluth. Today one of the reactivated SD75Is (8298) was sandwiched between a pair of newer units at Rices Point. It looked like they were waiting for a grain shuttle to come out of Riverland (Cargill) but I’m not positive. There is also a Saltie waiting at anchor in the lake and one loading at CHS in Superior.